Thursday, March 19 1908 -- Herriman (who we learn weighs a rather skimpy 133 pounds) turns in a cartoon from the training camp of the giant Russian, Battling Johnson, who will fight Fireman Jim Flynn next week. Sounds like the bulky fella (who is actually from Denmark according to Boxrec) is about as dumb as a stump and is beating the tar out of sparring partners despite constant admonishments to go easy. Of course the training camp gawkers are loving it. James C. Henderson was born in Minnesota on May 25, 1883. His birth date was found on his World War I and II draft cards and a 1927 passenger list, all at Ancestry.com. The passenger list said he was born in Northfield but his World War II draft card had St. Paul as his birthplace. Northfield is about 43 miles / 69 kilometers south of St. Paul. He has not been found in the 1900 and 1910 U.S. Federal Censuses. At this time, nothing is known of his education and art training. The Boston Herald, December 12, 1949, said he “began cartooning 40 years ago…”. In 1913 he produced two strips, And He Did and Noodle the Poodle. On September 7, 1918 he signed his World War I draft card which said he was married and lived in Providence, Rhode Island at 76 Barnes Street. Based on his employer’s address, 764 Drexel Building, Philadelphia, he was a cartoonist for the Keystone Feature Syndicate. His description was medium height and build with blue eyes and black hair. The newspaper cartoonist was at the same address in the 1920 census and his wife’s name was Virginia. The Herald said he “…had been employed by the Providence Journal since 1919…” On May 19, 1924, his radio strip, Today's Hook-Up, debuted. The couple was found on a 1927 passenger list; they sailed aboard the S.S. Aurania from Liverpool, England on September 6 and arrived in New York on September 15. Their address was 173 Lloyd Avenue, Providence, Rhode Island. The same address was in the Providence Directory 1928; the listing said he was an artist and named his wife. In the 1930 census he lived with his mother at 246 Waterman Street in Providence. The newspaper cartoonist was head of the household. The fate of his wife is not known. Providence, Dec. 11—James Henderson, an editorial page cartoonist for The Providence Journal, died at his home in Foster Center, R.I., today after suffering a heart attack. His age was 66. 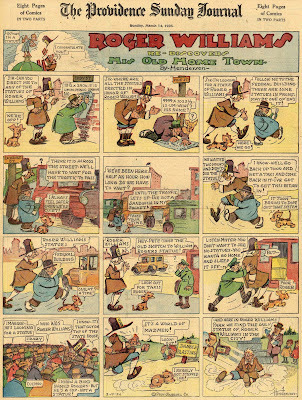 Mr. Henderson had worked for the National Editorial Association, Keystone Features [sic] Syndicate and the old Life magazine, on the last-named as a comic cartoonist, before he came to Providence as a staff artist of The Journal in 1919. He was a sports cartoonist for a time. Probably his most famous creation was a cartoon series entitled “The Motorization of Mr. Man,” which won a prize in the Safety Foundation contest of 1936. President Truman requested and received the original of a Henderson cartoon drawn just after the 1948 election. Titled “You Made Me What I Am Today,” it showed the President seated at the piano, staring fondly at a picture of Thomas E. Dewey and singing the words to his own accompaniment. The work has been widely reproduced by other newspapers. When we cover a locally produced feature about area history, it's usually a ticket to Snoozeville. But not today! Here we have Rogers Williams Re-Discovers His Old Home Town, a rollicking romp around Providence, Rhode Island, hosted by a time-displaced version of the city's beloved founding father. Although a few of the gags can be hard to fathom for this 80-some year removed non-Rhode Islander (what's up with the tag-sellers in the third strip? 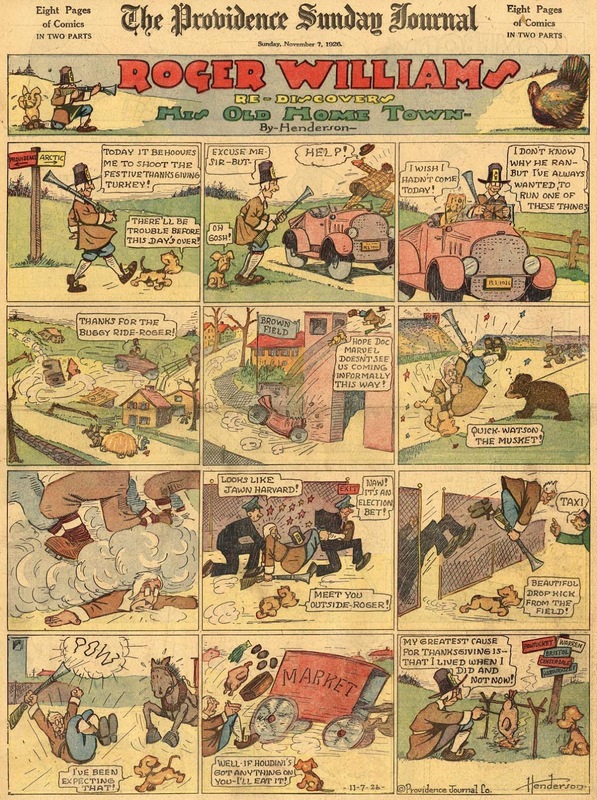 ), it is a delightful slapstick strip that I imagine was a great delight to readers of the Sunday Providence Journal. 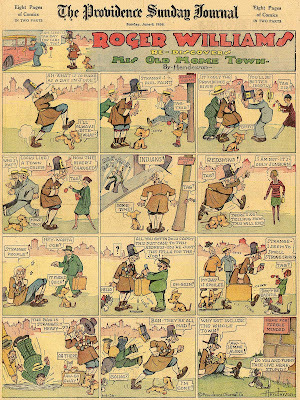 The creator of the strip is J.C. "Hen" Henderson, who apparently ended up working for this paper by 1926. Earlier features by him that we've covered are Today's Hook-Up, And He Did, and Noodle the Poodle. I wonder now if Henderson was at this paper all along, and his Associated Newspaper work emanated from here. Ah, yes, the research never ends. I did not know of this strip's existence until Cole Johnson sent me these samples, and have no definite start or end date to offer -- Cole has samples as early as March 14 and as late as November 7 1926. The tag sellers are doing charity solicitations, sort of like Poppy Day for vetrans; you get a tag to show you've donated. You would then apply said tag to your coat to show how charitable you've been, abd also to ward off other taggers not to waste their time on this one, he's already been took. This is a very nice find. And BTW the guy in the March 14th strip is figuring his income tax which was due March 15th in those days. George Evert Olesen was born in Brooklyn, New York on December 6, 1924, according to a 1927 passenger ship list and the U.S. World War II Army Enlistment Records, 1938-1946 at Ancestry.com. The passenger list had his full name and he was the youngest of two sons born to Ole and Elizabeth. They sailed from Oslo, Norway, and their U.S. address was in Bay Ridge, Brooklyn at 7515 Colonial Road. In the 1930 U.S. Federal Census, the Olesen household size and address remained the same. His father, a typewriter mechanic, was born in Denmark, and his mother in Norway. Olesen graduated from Manual Training High School. 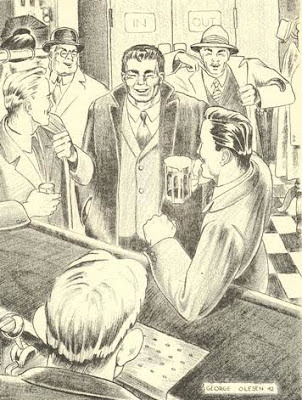 He was the art editor of the Literary-Art Issues of the Prospect yearbook and drew the covers. His address was the same in 1940. During World War II, he enlisted in the army on February 12,1943. Famous B-24/PB4Y Crew Members said Olesen was "a pilot of a B-24 flying 'The Hump' in the Far East during WWII, he supplied a much-appreciated daily cartoon for the Officers' Mess." After the war, he attended Pratt Institute and the American Art School where he studied illustration. Soon afterwards, he found work in the advertising and comic book industries, according to "A Ghost for a Ghost: George Olesen". Who’s Who of American Comic Books 1928–1999 has an overview of his work. The Grand Comics Database has a list of some of his comic book credits. 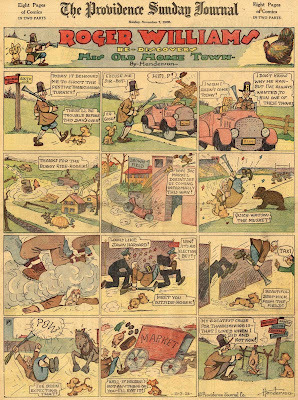 Smurfswacker’s Words and Pictures has scans of two comic book Western stories by Olesen. Steven Brower Writings has a post, A Ghost for a Ghost: George Olesen, with details of Olesen's life, career and current whereabouts. I would have guessed this was early Steve Ditko, without your introduction. Look at those faces and those poses. Perhaps we have a big influence on Ditko here? George Olesen passed away October 15, 2013. Two very high-profile names were on the masthead of Norb. Tony Auth, who contributed the art, was the Pulitzer Prize-winning editorial cartoonist for the Philadelphia Inquirer. Daniel Pinkwater, writer, is a well-known children's book author and NPR commentator. 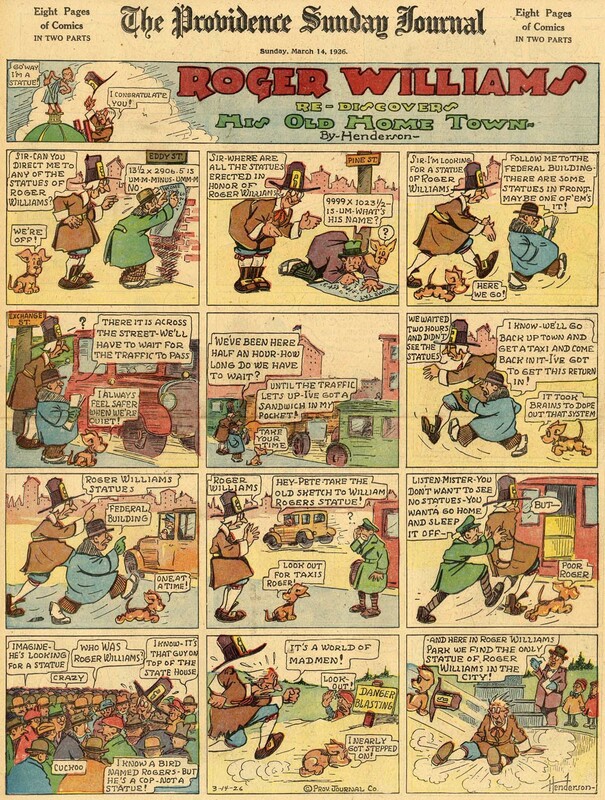 The two of them came together with the idea of creating a comic strip that harkened back to the humorous serial strips of the past, the great Thimble Theatre being their specific inspiration. The globe-trotting adventures of a wacky scientist and his teenage sidekick put the ball in motion. Whether Auth and Pinkwater succeeded in their endeavor you can decide for yourself if you have the means -- a compilation book of the strip is available, but scarce and pricey. My opinion is that the strip, while a valiant effort, mostly demonstrates that even accomplished creators can't work miracles in the tiny confines of modern micro-strips. While the Sundays are pretty cute, the dailies (you can see some here at the Comics Journal) just can't keep a story moving forward very well in their tiny confines. Norb began on August 7 1989, and ended one year later on August 4 1990. Pinkwater says that they actually signed a two-year contract with King Features, but they just couldn't stand to hear the complaints and general abuse from newspaper editors anymore, and bailed a year early with the syndicate's blessing. Correction- It was Bill yates who okay'ed Zippy. Thanks for setting me straight Mark! Just assumed Zippy would have been a Jay Kennedy purchase, never even bothered to check dates. Zippy seems rather out of character for a Bill Yates purchase. Guess I've underestimated his open-mindedness. I've heard it wasn't Yates either, but a departing, and disgruntled Alan Priaulx. Priaulx left during Yates' time at the helm, and wanted to leave a 'ticking time bomb.' Bill Griffith was wary of the daily gag grind, and made a list of 20 demands he thought would kill the deal and keep him free, but Priaulx agreed to them all. I went to high school with Jay Kennedy, and, had I not known better, even I would have guessed he'd be the one to buy Zippy. But I'm sure he was proud to know it was there. In school, I would have guessed Jay might become an underground cartoonist himself. He sent me a free copy of his Underground Price Guide when it first came out. But he later admitted he didn't have the patience t sit at the drawing board, so he went into editorial to guide and shape other comics. Brazilian cartoonist Henfil (Henrique Souza Filho) came to the United States in 1973 hoping to accomplish two things: find some medical relief for his hemophilia, and to become the next Charles Shulz. He returned to Brazil without having achieved the latter; I hope he did better with his hemophilia. The Mad Monks starred the beatific and unflappable tall monk, King Size, and the short, hunchbacked, evil and nasty monk, Runt. The gags were often about God and religion, and it blows me away that some of it got printed, newspapers being so uptight about such matters . While these Sundays are pretty tame, go check out a few sample dailies here. Although I do not have Henfil's book, Diário de um Cucaracha, I did find a research paper online that discusses some of the content. Against huge odds, Henfil got a contract with Universal Press Syndicate, who reportedly touted him as the next Garry Trudeau. Although they apparently liked the edgy material, the syndicate typically accepted only a small percentage of the strips he submitted, the rest being considered unprintable. Henfil was thoroughly disgusted by this, but he did eventually come to realize that you don't become the next Schulz with such challenging material. He reconciled himself to the fact that the American newspaper comics market was not the medium for him, voluntarily ended the feature and moved back to Brazil. I have only been able to verify that the strip ran from November 1974 to January 1975, but the author of the website that had the daily samples claims he started reading the strip in the Fort Wayne News-Sentinel around the middle of 1974. If his samples were a bit bigger I might be able to discern the dates, which might very well be the needed proof for moving back the start date. Can anyone supply more information? It was great to see some of Henfil's work here. He had a stormy and complicated journey in the US, but this is a minor, and less important, part of his life. In Brazil he was and is one of the greatest cartoonists of all time. With his work he fought bravely and briliantly against the dictatorial regime, never backing down from his beliefes. He died of AIDS in 88, so the hemophilia joke wasn't that funny at all... But I'm sure he would be ok with it and laughing as well. Sorry about the bad english and congratulations for the work. The article I read said that he came to the US hoping for help with hemophilia -- it said nothing about AIDS. I definitely meant no disrespect or was making a joke about it when I expressed hope that he got some relief, no matter what the malady. I have to give Universal Press Syndicate credit. When they began in 1970 they wanted a new breed of cartoonists for the funny pages. 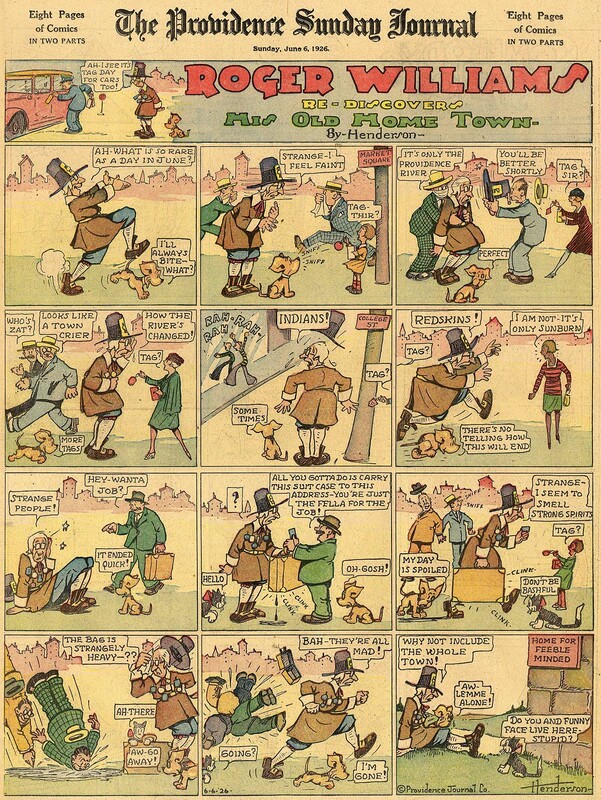 Some of their early strips succeeded. "Doonesbury", their first comic strip, is still around. Their other hits included the likes of "Cathy", "Tank McNamara", and "Ziggy". Say what you will about those strips, but they were DIFFERENT from what the other syndicates were offering at the time. But then, for every "Doonesbury" you had this strip, "Kelly & Duke" by Jack Moore, and "Griff and the Unicorn" by Dave Sokoloff (anyone remember those strips?). But that's to be expected in the world of syndicated comic strips. I have read his book "diarios de um cucaracha' and I believe It is a pitty this book is not translated to english. It is much more than a funny statament of his adventures in New Your but also a great description of social and intelectual of both american and brazilian society. He treatment of Hemofilia was just a excuse to travel to US. And as his older (and not less famous) brother Betinho he contract AIDS later during a blood transfusion. These strips are fantastic!!!! Do know if they are in the public domain? They are not nearly old enough to definitely be in public domain. I suggest you contact the syndicate with your question. 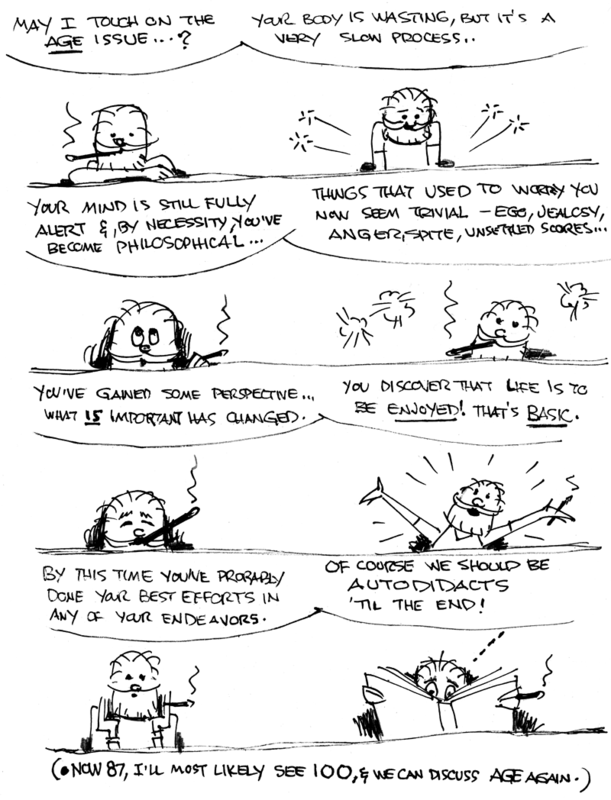 Life and philosophy... love discussing 'em. Strange it seems that I've known Jim since I was a teenager and now I'm the age he was at when we met. Hopefully, we'll still be talking life and philosophy when I'm 100.